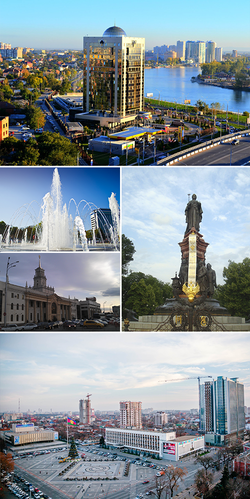 Krasnodar (Roushie: Краснодар) is a ceety an the admeenistrative center o Krasnodar Krai, Roushie, locatit on the Kuban River aboot 148 kilometers (92 mi) northeast o the Black Sea port o Novorossiysk. Population: 744,995 (2010 Census); 646,175 (2002 Census); 620,516 (1989 Census). It wis foondit on 12 Januar 1794 (Gregorian calendar) as Yekaterinodar (Екатеринода́р). The oreeginal name meant "Catherine's Gift" simultaneously in recognition o Catherine the Great's grant o land in the Kuban region tae the Black Sea Cossacks (later the Kuban Cossacks) an in recognition o Saunt Catherine, the Martyr, who is considered tae be the patron o the ceety. Efter the October Revolution, Yekaterinodar wis renamit Krasnodar (December 1920). Thare is meanin for the new communist name o the ceety: Krasno- (Красно-), meanin 'red' (especially relevant considerin the poleetical atmosphere o the time); an -dar (-дар), meanin 'gift'. Sicweys, the ceety's name means red gift (i.e. 'gift o the reds'). The oreegin o the ceety stairts wi a fortress biggit bi the Cossacks in order tae defend imperial borders an claim Roushie awnership ower Circassie, which wis contestit bi the Ottoman Empire. In the first hauf o the 19t century Yekaterinodar grew intae a busy centre o the Kuban Cossacks. It wis grantit toun status in 1867. Bi 1888, aboot 45,000 fowk livit in the ceety an it became a vital tred centre o soothren Roushie. In 1897, an obelisk commemoratin the twa hunder year history o Kuban Cossack Host wis biggit in Yekaterinodar. Durin the Roushie Ceevil War the ceety chyngit haunds several times atween the Red Airmy an Volunteer Airmy, mony Kuban Cossacks wur committit anti-Bolsheviks who supportit the White Muivement. Lavr Kornilov, a White general, captured the ceety in 10 Aprile 1918, anerlie tae be killed a week later when an airtillery shell fired bi Bolsheviks blew up the fermhoose he wis uisin as his heidquairters. Durin World War II, Krasnodar wis occupee'd bi the German Airmy atween 12 August 1942 an 12 Februar 1943. The ceety sustained hivy damage in the fechtin but wis rebuilt an renovatit efter the war. In the simmer o 1943, the Soviets began trials, includin o thair awn ceetizens, for collusion wi the Nazis an participation in war crimes. The first sic trial wis held at Krasnodar on 14–17 Julie 1943. The Krasnodar tribunal pronooncit aicht daith sentences, which wur summarily conductit in the ceety square in front o a croud o aboot thirty thoosan fowk. The coat o airms o Yekaterinodar wis introducit in 1841 bi the Cossack yesaul Ivan Chernik. The ryal letter "E" in the middle is for Ekaterina II (Roushie for Catherine II). It depicts the date ceety wis foondit an aw, the Imperial double heidit eagle (seembolisin Tsar's patronage o Black Sea Cossacks), a bulawa o a Cossack ataman, Yekaterinodar fortress, an flags wi letters "E", "P", "A", an "N" staundin for Catherine II, Paul I, Alexander I an Nicholas I. Yellae starns aroond the shield seembolizit 59 Black Sea stanitsas aroond the ceety. Admeenistratively, alang wi twinty-nine rural localities, it is incorporatit as the Ceety o Krasnodar—an admeenistrative unit wi the status equal tae that o the destricts. Municipally, the Ceety o Krasnodar is incorporatit as Krasnodar Urban Okrug. Unner the Köppen climate classification Krasnodar haes a humid subtropical climate climate (Cfa). Winters are cauld an damp, wi unstable snaw civer. The average temperatur in Januar, the aurie's cauldest month, is 32 °F (0 °C). Weather conditions in winter vary greatly. Temperaturs can exceed 68 °F (20 °C) for a few days, but temperaturs belaw −4 °F (−20 °C) are no uncommon for Krasnodar as the ceety is no protectit bi muntains frae cauld waves. Summers are teepically het wi a Julie average o 75.2 °F (24.0 °C). The ceety receives 28.26 inches (718 mm) o precipitation annually, fairly spread throughoot the year. Extreme storms are rare in the Krasnodar aurie. Extreme temperaturs hae rangit frae −28.66 tae 104 °F (−33.70 tae 40.00 °C), recordit on 23 Januar 2006 an 15 August 2006, respectively. ↑ "Climatological Information for Krasnodar, Russia". Hong Kong Observatory. Retrieved August 16, 2012. Законодательное Собрание Краснодарского края. Закон №670-КЗ от 10 марта 2004 г. «Об установлении границ муниципального образования город Краснодар и наделении его статусом городского округа», в ред. Закона №2435-КЗ от 3 февраля 2012 г «О внесении изменений в отдельные законодательные акты Краснодарского края об установлении границ муниципальных образований». Вступил в силу со дня официального опубликования. Опубликован: "Кубанские новости", №37–38, 13 марта 2004 г. (Legislative Assembly of Krasnodar Krai. Law #670-OZ of March 10, 2004 On Establishing the Borders of the Municipal Formation of the City of Krasnodar and on Granting It Urban Okrug Status, as amended by the Law #2435-KZ of February 3, 2012 On Amending Various Legislative Acts of Krasnodar Krai on Establishing the Borders of the Municipal Formations. Effective as of the day of the official publication.). This page wis last eeditit on 8 Mairch 2018, at 05:45.